When we travel, we like to have a fridge in our hotel room. You know? Scoping out the local restaurant scene is all well and good, but a family of five (with three members under the age of six) emphatically does not want to spend too much time in restaurants. So we stock up on arrival: milk and cereal for the morning, PB&J fixings for lunch, a pile of fruit and some choice snacks to keep everyone’s energy up for adventuring. But this time I had a little idea when I stopped into the natural foods store and I swung by the bulk bins for the fixings to make overnight oats. A handful of oats, milk and/or yogurt (both could easily be vegan–or water or juice, for that matter), toppings. The oats get creamy with an overnight soak in the fridge, and although I sweetened mine with fruit, it wouldn’t be wrong to drizzle a little maple syrup or honey on your bowl. If you travel with that sort of thing. This is definitely going to be my new breakfast of choice on the road. What’s yours? 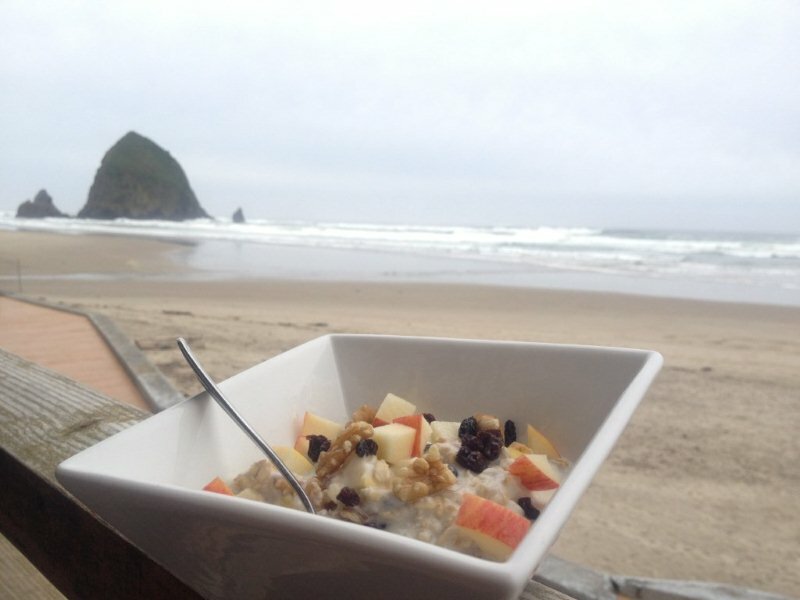 What are your travel tips for eating well? I am really enjoying all the good ideas and advice I am getting in the food blogging world. p.s. I should really let you know about the great latte and ace baked goods I found at Sleepy Monk Coffee Roasters in Cannon Beach, OR. Check it out if you’re passing through! Overnight Oats with Apple, Currants, and Walnuts: Toss a handful or two of oats into a bowl and add milk to just cover them. Soak overnight in the fridge. In the morning, stir in a scoop of yogurt (you could also add the yogurt the night before), half a chopped apple, a handful of currants or raisins, and a handful of broken walnuts. This entry was posted in Breakfast, Easily Multiplies to Feed a Crowd, Vegan or Would-Be-Just-As-Good-Vegan and tagged breakfast, cooking, DIY, family, food, healthy, homemade, kids, lifestyle, recipes, vegan, vegetarian, whole grain on April 17, 2012 by emmycooks. Love the shot of Cannon Beach. Beautiful. Greetings from a snow covered beach north of the Arctic Circle. What a great idea! I have heard of cooking oatmeal in a slow cooker, but never just letting the oats soak up yummy milk in the fridge overnight! This is really brilliant. Thanks, Emmy! I love this recipe and have a similar verson on my blog Full of Beanz! It’s the overnight oats revolution! Do you eat them cold, or do you give them a quick zap in the microwave? I love oats and am always looking for another way to eat them! Wow! I thought we were the only ones! I travel w/ a mix of grains then buy good bread, soy milk, fruit, and coconut yogurt. Never know what lunch and dinner may be, but breakfast is all figured out! Yay! When we were little, my mom did that with barley, nuts and jaggery (a natural date palm syrup that has been dried and concentrated, tastes better than brown sugar). It tasted delicious, chewy and nutty the next day. I had forgotten all about that. Thanks for the reminder and the great new idea! Lovely pic. And I hear you on the traveling with a horde problem. Kitchenettes are a blessing. I love this idea! What a great thing you are doing for your kids, starting their day off with a nice, healthy breakfast–even on vacation :) Definitely want to give this a try. Brilliant! I’m trying to eat oatmeal most mornings, but I don’t always have time to cook it. It never occurred to me that I could get my bowl of goodness ready the night ahead. I’m trying this tonight! Emmycooks to the rescue again! One look and I knew it was Cannon Beach! It looks fab and I love the oatmeal suggestion! I hope you had a great time! I think I’ve made various versions of overnight oats every day since you posted this ;) Huge thank you!